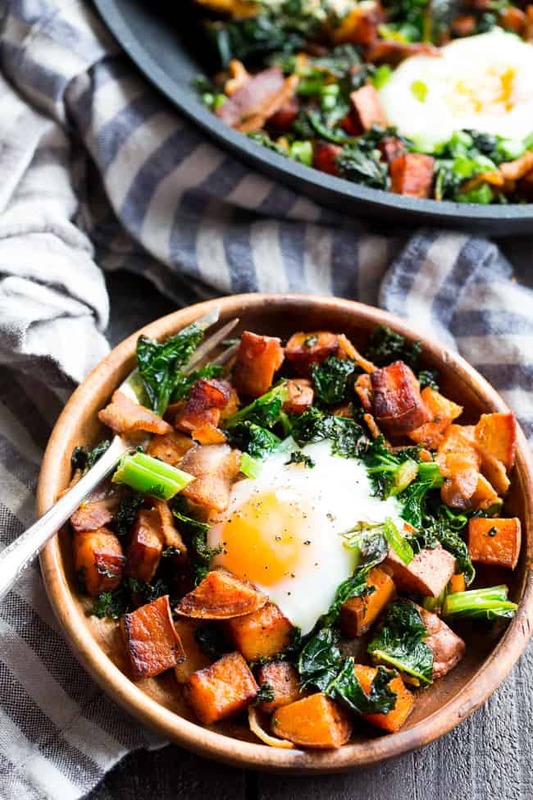 This simple sweet potato hash with kale and bacon is your new paleo and Whole30 go-to breakfast! 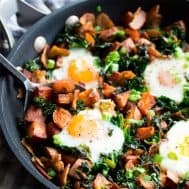 Crispy bacon, kale, and sweet potatoes are seasoned and cooked up perfectly in a big skillet, then topped with eggs and garnished with green onion. 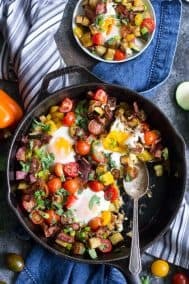 It doesn’t get easier or more delicious than this hash! 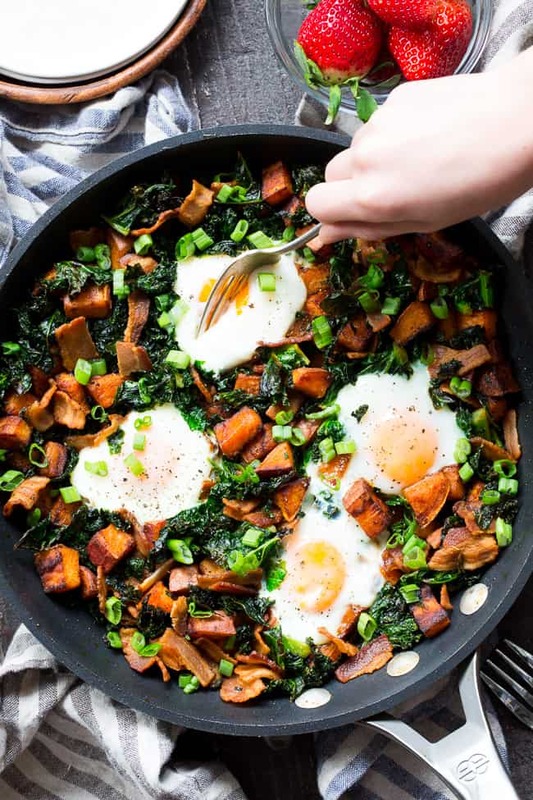 The famous sweet potato hash that I LIVE ON (actually LIVE on some days) is finally getting its own “official” spot on the blog. Okay, I know that some of you are longtime followers that are well aware I’ve had a single-serve version of this hash on here for a couple of years. 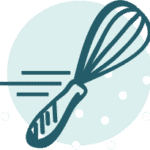 So, why do I a separate recipe if I’m just making more of the same? Here’s the deal – to preserve the quality of this hash (AKA keep it crisp-pay!) the method needs to change just a bit. 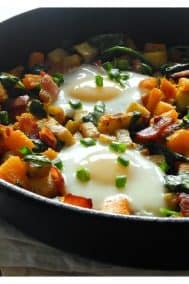 Stay with me, it’s not a big change, and it’s well worth it to feel more people this delicious crispy sweet potato hash! It all comes down to more quantity = less room = less crisp for all the ingredients. Unless you have a giganto skillet that heats nice and evenly (I wish) you simply can’t expect a hash for 4 to come out just as crispy made all in one pan as a hash for 1. And let me tell you – if anyone in your household happens to grab a bite of your hash, they’re going to want some (proven fact.). 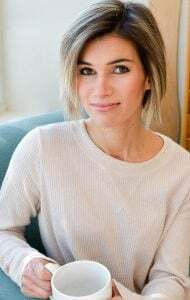 Even people who believe they “hate” kale will want to know what that crispy fried green thing in your breakfast is, because it tastes like chips, and, please share. Please. Anyway, the change is really very simple and just involves using two skillets instead of one – phew! You’ll need a cover for both skillets, although I stress to you that these covers don’t actually need to match your skillets exactly – only approximately, if that makes sense! For mine, I just use whatever covers I’ve had lying around from years of collecting cookware, and I’ve never had an issue with something not cooking properly. Not professional, but this is real life after all, and if it ain’t broke, no need to fix. So, the two skillets. One will be used to cook your sweet potatoes, and, the other to cook your bacon and kale. One of these skillets does need to be oven proof – not necessarily cast iron – but something that can withstand a 400 degree oven, since you’ll be baking your eggs in the skillet with the hash at the end. I actually did not use a cast iron when I made this the other day, but rather these non-stick frying pans which are great for cooking sweet potatoes! However, if you have well-seasoned cast iron skillets, they’ll work fine for this hash. 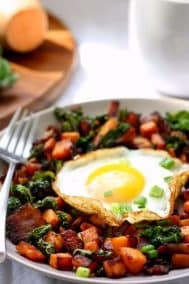 So, by popular demand – here it is – the “big” version of my favorite sweet potato hash with kale and bacon! Super simple, with just 4 ingredients plus salt and seasonings – really can’t beat that! Speaking of seasonings, I didn’t specify anything because that’s where you can really customize this hash to suit your tastes. Some days I season my potatoes with salt, pepper, and smoked paprika, other days just salt and pepper, and sometimes I get fancy and go with taco seasoning, OR this delicious breakfast blend from Primal Palate. 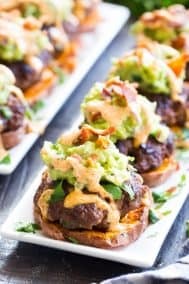 Get creative and go with your cravings here! 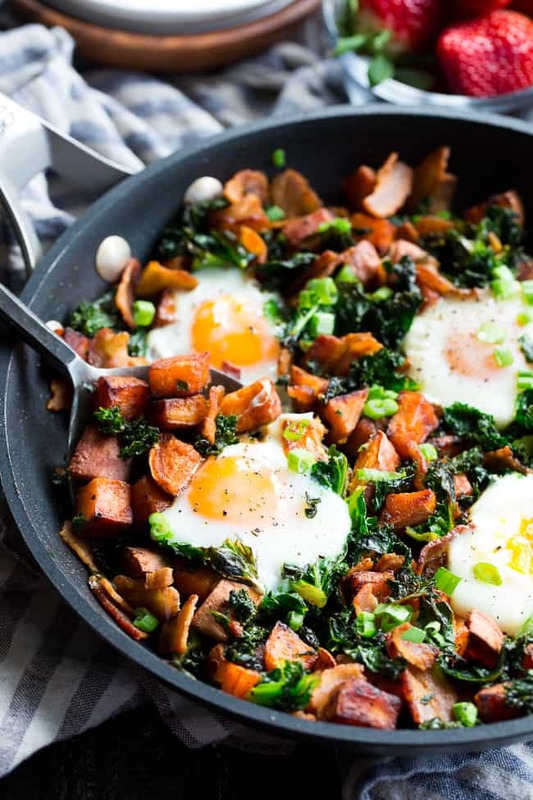 I hope you’re ready to make this paleo and Whole30 sweet potato hash! And finally – you’ll have enough to share – let’s go! 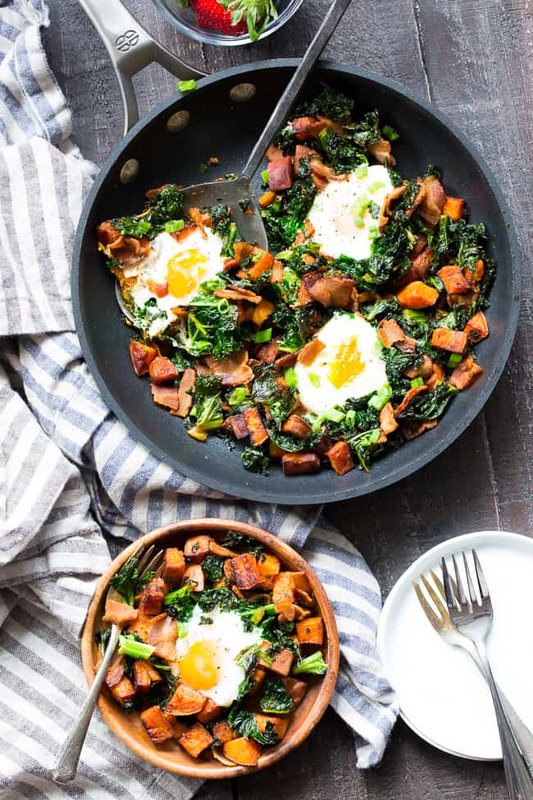 This simple sweet potato hash with kale and bacon is your new paleo and Whole30 go-to breakfast! 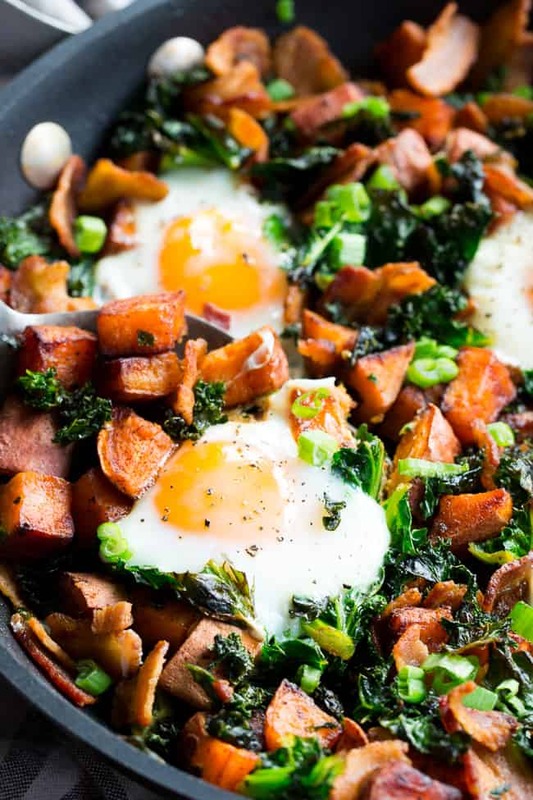 Crispy bacon, kale, and sweet potatoes are seasoned and cooked up perfectly in a big skillet, then topped with eggs and garnished with green onion. Add the bacon to the medium-hi skillet and melt the cooking fat (ghee or coconut oil) in the other for the potatoes. Add cubed sweet potatoes and stir with a spatula to evenly coat. Sprinkle with salt, pepper, and other desired seasonings and allow to cook, uncovered for about 2 minutes. Stir again, then cover the skillet and cook about 4 minutes to soften, stirring once midway. Uncover, stir (and arrange in a single layer) and lower heat to medium low to avoid excess browning if necessary. At this point, potatoes should be softened, and you can cook uncovered to brown them a bit more. 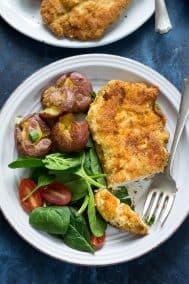 If potatoes aren’t completely soft on the inside yet, I recommend adding a bit more cooking fat and covering the skillet for another minute or 2. Once done, remove from heat. Meanwhile, brown the bacon in the other skillet until crisp, but not overly well done. Remove with slotted spoon to drain on paper towel and turn off the heat. Drain some of the rendered fat, leaving 1-2 Tbsp in the skillet. You can always add more fat if needed later on. Turn the heat to medium. If using the onion, add it now, cooking until translucent. Then, add all the kale (it cooks down quickly) and sprinkle with a just bit of salt, stir gently and cover the skillet to soften. 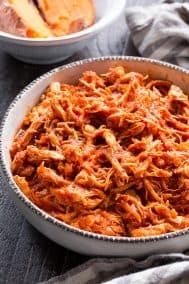 After 1-2 minutes, uncover, stir, and continue to cook, stirring occasionally, another 2-3 minutes until it begins to crisp, adding fat and adjusting heat if necessary. Once both softened and crisping, remove from heat. 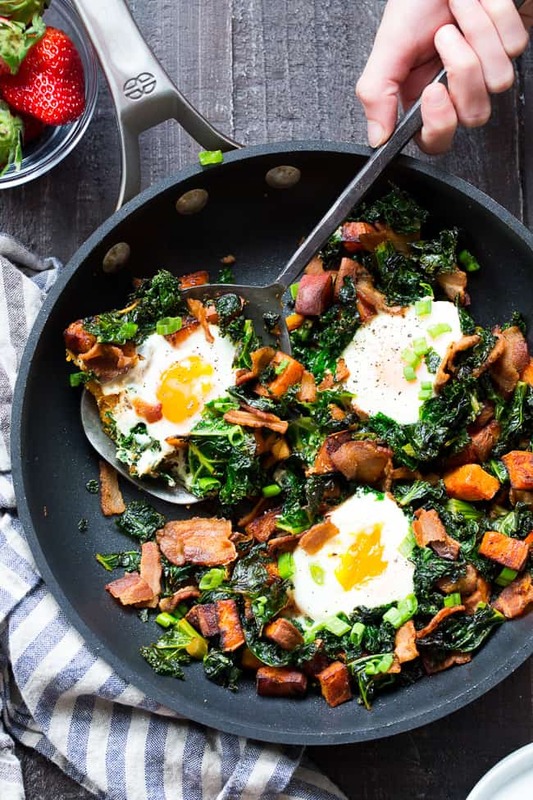 Transfer kale (and onions if using), bacon, and sweet potatoes to one skillet (the ovenproof one!) and make 4 spaces in the hash where you want to place the eggs. Carefully crack each egg into its designated space and sprinkle with a bit of salt and pepper and any other desired seasonings. Place skillet in the preheated oven and bake until eggs are cooked to preference - this took about 10 minutes for me. 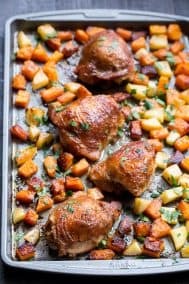 Using a potholder, remove skillet from oven and garnish with green onion. Serve hot and enjoy! *Any cover that mostly fits your skillets will work here - don't worry about using a "match" - none of mine fit perfectly! 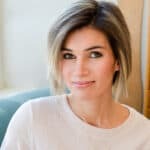 Want More Paleo and Whole30 Hash Recipes? Try One of These! Can you use frozen kale?? This was so good! I made it with spinach instead of kale (that is what I had on hand). My husband are a whole bowl, and he is not doing Whole 30 with me! Thanks for the great meal idea! Love it! I lived on this for two days straight. First made it with spinach, then changed up the bacon with ground beef and turned it into a dinner. Serving suggestion, I plated them individually in pasta bowls, cracked the eggs on the each plate and then put them in the oven. No mess while serving. Thanks for a great recipe! So thrilled you liked it! I could live on this for a week straight I think 🙂 Love the idea with the eggs! 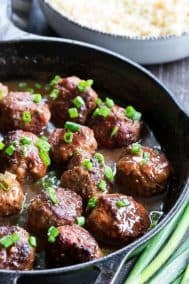 I made this recipe this morning for me and my husband for a celebratory breakfast after he got good news at work. It was very good and actually pretty easy to make and I felt healthy eating it. The flavors all went really well together. Hello,I am new and i have a lot of questions. Can you say me if the macros is for one serving or is for all?? Also wondering if it’s macros/nutrition per serving for for whole recipe? Thanks! Are you suggesting to bake the sweet potatoes first? Or can the freshly cut ones just go right into the skillet?